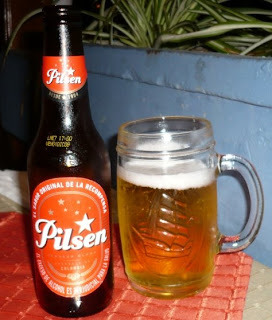 Sure it’s not a Belgian beer, but then, “Pilsen” is not from the Bohemian town that gave us the great style of beer. Produced by the Bavaria brewery, this Colombian beer has something of an identity problem. I’ve just been sampling it here in Medellín, and I can report it is indeed a beer in the pilsner style. Not too bad, but in no way exceptional. The name just begs an appellation discussion, though. Weren’t the Czechs trying to get legal protection for the name “pilsner” or something?